Few scenarios represent the summer to the same degree as enjoying a refreshing ice cream cone on a sunny day. Visiting an ice cream shop requires you to pick not only your favorite flavor of ice cream but also your desired cone. Many shops also provide alternatives to traditional cones, including the waffle cone. Enjoying your ice cream in a waffle cone provides a crunchy taste but raises the caloric content of your treat. When you consume an ice cream cone, it's not just the calories in the ice cream that you must consider. Waffle cones have the highest caloric content of any form of ice cream cone, according to the U.S. Department of Agriculture's National Nutrient Database. The USDA reports that a large waffle cone contains 121 calories. This amount is significantly higher than sugar cones, which have 40 calories per cone. 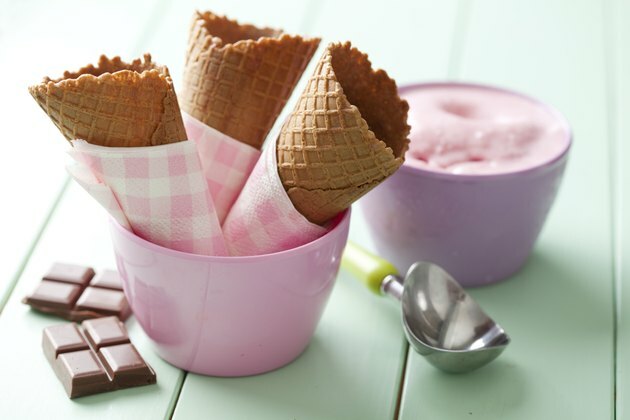 Traditional, wafer-style ice cream cones have the fewest calories, with 17 per cone.